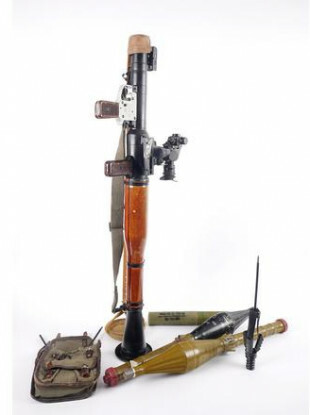 A DUBLIN BASED auctioneer has defended its decision to sell a decommissioned rocket launcher advertised as one similar to the RPG-7 used by the IRA during the Troubles. Whyte’s Auctioneer is advertising the rocket launcher along with two inert rocket-propelled grenades, inter booster rocket and accessories. The item, which goes on sale as part of the auctioneer’s “Eclectic Collector” sale on 6 April, is expected to fetch between €4,000 to €6,000. According to the auctioneer’s catalogue, the RPG-7 was “used by the Provisional IRA in Northern Ireland from 1969 to 1998″. “Most notably in Lurgan, County Armagh, where it was used against British Army observation posts and the military base at Kitchen Hill in the town”. Defending the decision to sell the item, Ian Whyte told RTÉ’s News at One that the rocket launcher in question is “part of history”. Whyte added that he was unsure whether or not the rocket launcher was actually used in Ireland but said it had been deactivated in Birmingham to EU standards. It’s part of history, that’s the way we look at it. We sell all sorts of weapons provided that they are decommissioned and can’t be used again. Email “'It's part of history': Auctioneer defends decision to sell deactivated rocket launcher ”. Feedback on “'It's part of history': Auctioneer defends decision to sell deactivated rocket launcher ”.